Isn’t the very definition of “parent” giving your child the best life they can possibly have, regardless of whether it’s what you expected? These are the assumptions that people automatically make, people who want to be angry on our daughter’s behalf, people who are shocked and appalled that this could still happen today, and in Canada. But everything changed the day we met our daughter’s birth parents. Hate. Anger. Pity. That’s what people expect us to feel towards them. None of those words apply. Courage, strength, endless love, grace under pressure—those are far more accurate. They are two people in this world who had a vision of what their lives would be like, and part of that vision—a huge part of it—was raising a child as part of a family, a family that would support them, a family that would be there physically and emotionally to help raise this child, celebrate this child and watch this child grow into adulthood. Then suddenly, without warning, that no longer existed for them. Have we not heard that it takes a village to raise a child? Overnight their village disappeared and they faced raising this child completely on their own, without any support system at all. They were two people facing new and scary words: Down syndrome, heart defects, delays, risk of cancer, cataracts, surgery. Imagine yourself in that position. Imagine being all alone. Imagine the despair, the fear, the isolation. Imagine the love. Because love is there all along –it doesn’t disappear. Love for this tiny human, love so strong that you want to give them everything in the world. Love so powerful that you forced to realize that for them to have everything, it means walking away. Love that allows you to see, clearly, that you do not have the finances, the support or the resources, to give this child the very best chance at an amazing life. It’s a love story that we’ve heard a thousand times; to willingly break your heart into pieces so that this person can have it all. To physically remove a part of your should, your very being, and give it to another person to protect, to care for, to love. No one chooses this unless the love they have is absolutely pure. We have the gift of an open adoption—a gift for each of us. We get to witness this love between our daughter and her birth parents and it fills our heart with happiness. Her birth parents get to show her love, to support her in their own way, and to be able to actually see that they made the right choice. Our daughter, our collective daughter, will grow up knowing that pure love. If that isn’t giving her everything then I don’t know what is. If that isn’t the very definition of parent, then I’m at a loss for words. 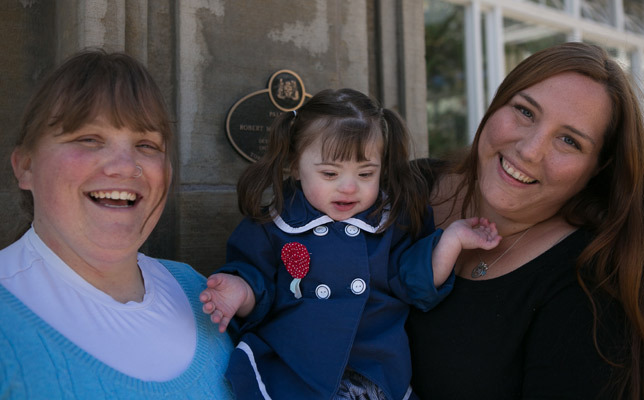 Crystal, her wife, Jessica and their adopted daughter Lily, live in Toronto, and are hoping to add another sibling to the mix soon. Crystal created their blog, Giggle and Hugs, to share their journey as parents to a child with Down Syndrome. Previous PostLife After Placement: 9 Birthmothers Share Their StoriesNext PostWill Sandra Bullock’s New Adoption Inspire Others To Adopt From Foster Care?